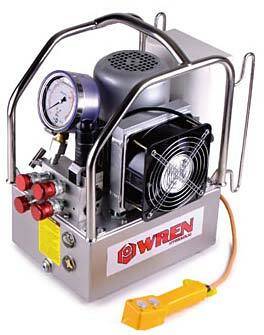 The 240 Volt KLW-4000 and Air driven KLW-4000N Hydraulic Wrench pump. The KLW-4000 series high torque wrench pump are proven in the petrochemical mining and industries. Found throughout Australia in Mines & Power Stations, these pumps offer fast flow rates, less weight, and reliable continuous operation for all double-acting torque wrenches. Used by all the major wrench manufacturers as the preferred pump. The Auto shift valve makes the pumps easy to use via the remote control. The Electric 240V KLW-4000 High Torque Wrench pump are fast, Light, Reliable, Compact, and supplied fully operational ready togo. Designed for double acting Torque Wrenches. The KLW-4000 Pump will run tools from 100 to 55,000 Ft Lbs. 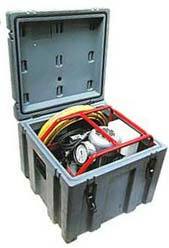 The 240Volt wrench pumps offer the best solution if air is un-available. No heating with oil heat exchanger to keep oil cool - ideal for long lasting production work . The KLW-4000 Pump is quieter, faster and more responsive than older pumps. The 3 stage Hydraulic Pump means when the wrench is unloaded during retract or pre-torque, the flow increases speeding up the low-pressure cycle. This is particularly evident on larger high torque IBT 5, and bigger tools with large capasity pistons. Setting The regulator for the advance pressure guage is simple and easy. 2 turn winding the regulator up and down. 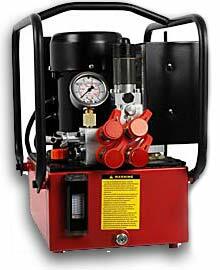 Pressure is set accurately within 2 rotations from 1000PSI to 10,000PSI and you're ready to go. The Pump Remote is a good size and weight. Top button starts/stops the pump, the second button advances the wrench when pressed. When released, the auto retract the wrench. These pumps offer great balance of size, speed and power. The smal size make for easy carry into anywhere or into difficult access areas. Heavy Duty Shipping containers for weathproof Site Boxes are available. Fast, Reliable and supplied ready to work. Designed to work using a low air flow and 100PSI pressure The KLW-4000N pumps operate tools from 100 to 50,000 Nm. Pumps driven by air are a perfect problem solver if electricity is un-available or not safe to use. Over heating is solved by the inflow air moving over the oil and work best for long/big production jobs. The Pump Remote is perfect size and dimensions. Top button starts and stops the pump. The second button advances the hydraulic wrench forward when pressed. Then released to auto retract. Hydraulic Torque Wrench. The KLW-4000N is quieter and more responsive than the older pump designs. The 3 stage Hydraulic Pump means when the tool is un-loaded during retract or pre torque, The faster flow increase speeds up the low-pressure retract cycle. This is particularly evident on high torque IBT-25 and above with larger oil capasity piston size. The Regulator is set to increase the Pressure, thus increase the torque. Simple winding the regulator up and down. 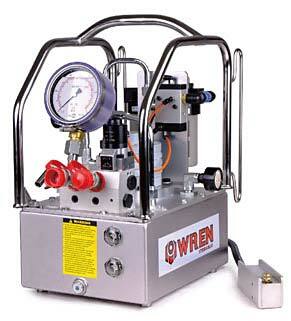 The pressure is set accurately within two rotations from 1000 - 10,000 psi and your tool is ready to work. These newer pumps are so much better than the older models. The Heat exchanger keeps the oil cool and flows at high levels. They can work all day, every day. Weatherproof Site containers are optional. All High-Torque hoses are rated to Minimum 4:1 - that means 10,000 PSI Pump working pressure, with 40,000PSI burst limit. This is standard requirement for any double acting wrench system. 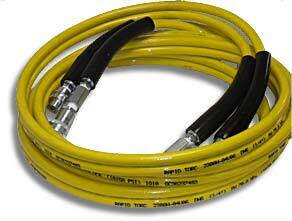 Hoses are twinlines, come with standard 1/4" screw couplers + fittings. Pump Hoses are assembled, bleed and tested and with Hydraulic Test tags before delivery. All hoses are tagged and marked - "High Torque HOSE" - Safety first with High Pressure Equipment at all times. Offering maximum versatility with Reliable, Fast proven in the field. 240 Volt or Pneumatic Hydraulic Pump Power Packs come with Pressure Gauge, Regulator, Couplers & Oil, 3 metre Remote Control. Ready to go. 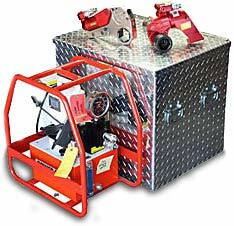 Both Pumps fit in our Shipping Containers along with theTorque Wrench, Torque Chart, Hose, and sockets. 2 port & 4 port & 8 port -These High Torque Wrench Pumps are set up to run Hydraulic Torque Spanner Square Drive and Hex Cassette Hydraulic Spanner type wrenches. The Electric 240 Volt Driven High Torque Wrench pumps are the most popular, fast, Compact, Reliable, and supplied full of Oil ready to go. The Shipping Containers are heavy duty plastic boxes with a water tight seal. Strong handles on each side collapse into a cavity for ease of storage and stacking. Locks can be fitted with simple cable ties or keyed padlocks. Our Pumps are so much better than everyone elses Pumps. I dont know why you would buy any other! We deliver all our Pump Equipment no matter where you are in Australia.